Depending on where you are located in the country and the industry where you work, you may find fully threaded studs under the name of threaded rod, continuous thread or even all-thread. 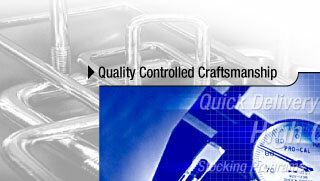 It is a highly versatile fastener that is easy to use and offers the strength you need for any type of fastening job. At R & R Engineering Co., we offer customized design and manufacturing of threaded studs for many different industries, manufacturers, and fabricators. While standard sizes are often all that is needed, it is possible to create different threads and diameters depending on the specific use and needs of our customers. True fully threaded studs are threaded just as the name implies. This means that the thread is continuous along the entire length of the stud. These fully threaded studs are available in any diameter in standard bar stock sizes as well as for custom extrusions that are then threaded to create the fastener diameter and length required. The length of these studs is measured from end to end. This is because the ends of the studs are carefully threaded to allow the nut to immediately grab the thread. There is also the option to have a slight chamfer to either the end. This is not a pronounced taper, but it will be easier to start the nut. With this style the length is actually measured from the first thread, not the end as that slightly chamfered space does not contain a full thread. There are many different applications for fully threaded studs one of which being the construction industry. However, for parts or components that have to be taken apart and assembled, small diameter threaded studs and wing nuts can be a very good option.